Enjoy a picturesque forest view any time of the year in a vacation home from Southern Comfort Cabin Rentals. 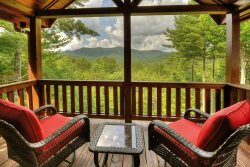 Browse North Georgia cabin rentals offering a wooded setting for added privacy. Watch the leaves change in the fall or the flowers bloom in the spring.